Heliodinids are tiny, brightly colored dayflying moths. 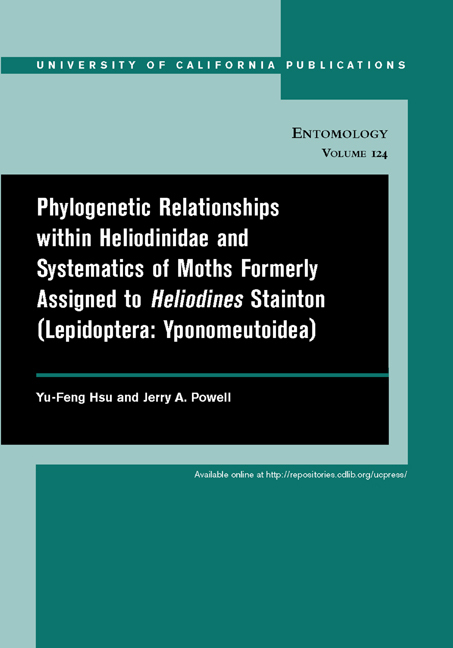 Phylogenetic relationships among genera of Heliodinidae are proposed using parsimony and character compatibility. We describe and illustrate 45 North and Central species (25 newly named) assigned to five genera (two new, two exhumed from synonymy). Larval host plants are recorded for 33 species (14 newly discovered), about 45% of the known fauna; 90% of these are specialists on Caryophyllales, primarliy Nyctaginaceae. Yu-Feng Hsu is Associate Professor of Life Sciences at National Taiwan Normal University. Jerry A. Powell is Professor Emeritus of Entomology at the University of California, Berkeley and Director Emeritus of the Essig Museum of Entomology.